NEW YORK, NY - MAY 07: Michael Bloomberg Mayor of New York City speaks at the Robin Hood Veterans Summit at Intrepid Sea-Air-Space Museum on May 7, 2012 in New York City. Mr. Bloomberg said that he believed Mr. Romney would probably be better at running the country than Mr. Obama, according to two guests. But Mr. Bloomberg said he could not support Mr. Romney because he disagreed with him on so many social issues, these two people said. The mayor mentioned two such issues: abortion rights and gun control. 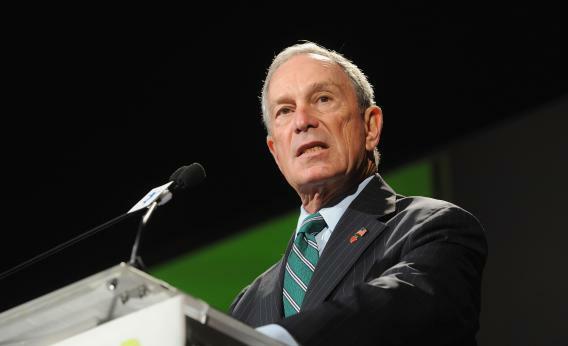 As a result, Mr. Bloomberg said, he intended to remain neutral, said one guest. Bloomberg fits the profile of the socially liberal Wall Street types who have soured on Obama since he starting calling them “fat cat bankers” and pushing the 2010 Dodd Frank financial reform law. And he was suspected to be a quiet backer of John McCain in 2008. Obama tacitly endorsed the mayor by declining to campaign for his Democratic challenger, Bill Thompson, in the 2009 mayoral race, which ended up being extremely close. An intervention by the president might have been a gamechanger. Apparently miffed by Obama’s populist rhetoric, Bloomy doesn’t seem to be returning the favor.